Today is the Feast of the Dormition (“Falling Asleep”) of the Mother of God. The mother of our Lord submitted herself to the will of God as spoken by the Archangel Gabriel. She conceived by the Holy Spirit and gave birth to her Son, Jesus Christ, the Son of God and Savior of the world. Her own life was wrapped up in the life of her Son. She suffered with Him, not only as a disciple, but as His loving mother. When her only Son was dying, hanging by the nails of a rough wooden cross, she was there with him. She stood before the Cross next to her Son’s beloved disciple, John. Jesus spoke to John saying, “Here is your mother,” and to Mary, “Here is your son.” From the Cross, Christ placed his mother under John’s care and established her as the mother of the whole Church, the family of His disciples. After her Son’s death, burial, resurrection from the dead, and ascension into heaven she remained with the disciples. On the day of Pentecost when the Holy Spirit came upon the Church she was there with the Apostles. Can you imagine how much the early Church loved and respected the devoted mother of our Lord? In the icon of her falling asleep, Mary’s body lays on a funeral bier with the Apostles gathered around. Her Immortal Son, the Risen Lord, appears in all His radiant divine glory beside her lifeless body. Christ has come to receive His mother into His heavenly kingdom. In His hands, He holds the pure soul of his mother, wrapped in the white swaddling clothes of an innocent child. The portrayal of the Virgin Mary as a baby wrapped in swaddling clothes and held by her Son echoes the icon of Christ’s Nativity, which shows the Virgin Mary with the infant Jesus, wrapped in swaddling clothes and laying in a manger. As Mary cared for Jesus after his birth when He came into the world, Jesus cared for His mother after her physical death when she left the world. Let’s remember the words of the Archangel Gabriel to the Virgin Mary, “Rejoice, highly favored one, the Lord is with you; blessed are you among women!” Let’s also keep the following words of Christ from today’s Gospel reading in our hearts: “And it happened, as He spoke these things, that a certain woman from the crowd raised her voice and said to Him, ‘Blessed is the womb that bore You, and the breasts which nursed You!’ But He said, ‘More than that, blessed are those who hear the word of God and keep it!’” (Luke 1.28; 11.27-28, NKJV). The Virgin Mary is honored, not only because she is His mother, but because she, as His mother, believed the word of God and followed it with complete faith, love, and humility. She shows us what a true disciple of Jesus Christ should look like. Copyright © 2006 by Dana S. Kees. 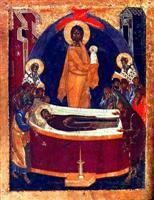 The icon of the Dormition is in the public domain.